Several people have that I share the video of my familiarization tour to Alaska sponsored by Waypoint Yacht Charter Services in Travelogues at Trang web cá cược trực tuyến www.themiracleofkangaroomothercare.com. Here is the famous transfer scene followed by a more placid paddle to from the glacier back to the mother ship on Glacier Bay in Alaska. Saturday July 18, 2009 will be the annual Shared Adventures "Day on the Beach." 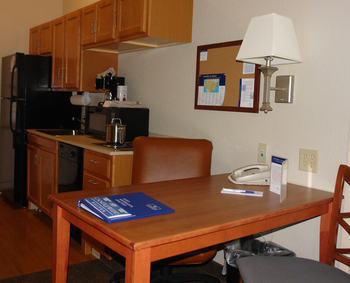 This year with Pacific Blue Inn open to offer accessible accommodation the area continues to grow in it appeal to travelers with disabilities. Santa Cruz Harbor has both a ramp and a power lift on the South Dock to take those with mobility impairments from the pier down to the floating dock and onto one of several charter vessels that, while not fully accessible, regularly making the Bay accessible to people with disabilities. What happens when you put two specialists in Inclusive Travel together for day in San Francisco? This year Bill accompanied over 30 of his clients on a spectacular TravAbility tour touching down in San Francisco at the start and finish but ranging from Vancouver and Victoria, BC through the Canadian Rockies to Banff and Lake Louise as well as up into Alasaka by cruise ship. Bill, an outstanding tour guide, arranged for one of his guests with a mobility impairment to take a helicopter ride in Alaska and had the dog sled and mush team waiting to carry her directly from the chopper to the ride of her life! Of course, things did not go with such clockwork precision with Scott in charge of the day's itinerary on a road trip around his backyard. Heading north from Bill's hotel at SFO we decided to skip the urban scene in San Francisco this year and drive Marin County north of Golden Gate Bridge. Muir Beach, Stinson Beach, and eventually Point Reyes were stops of interest along the way. Scott's memory of "shortcuts" to Muir Woods was a little foggy so that gorgeous destination will have to wait until next year's itinerary. But the best part of these get togethers is the uninterupted opportunity to talk. And when two Inclusive Travel promoters get together they talk new itineraries, old friends, and future trends. Bill had just returned from meeting Judie Moffet of Power Inc. (People On Wheels Encouraging Responsibility) in Longview, Texas. Toting a paper copy of this great article on Judie called, "A True Roll Model" I learned of a dynamic group of people that I want to show around Northern California and beyond. Bill had also had a near encounter with Sherri Backstrom of Waypoint Yacht Charter Services of Bellingham, WA while he was in BC. I wonder what dynamic trip would result from Judie's Power crew teaming up with Sherri's accessible yacht fleet? Typical of two guys caught up in conversation and a road trip I captured no photos and brought Bill to the airport too late for us to have dinner together! Hungry and tired it was still an enjoyable day. I look forward to next year, Bill. Sneak peak of the first Be Stoked SF celebration of inclusive outdoor sports on san Francisco Bay. Well, I thought yesterday would be a simple photo shoot. In and out. Instead it turned into a spontaneous "gathering of the tribes." That's the charm of the place. Locals know that santa Cruz style is so laid back that most every attempt at organized encounters morphs into something delightfully unexpected. Yesterday was no exception at 636 Pacfic Avenue strategically placed between downtown and the beach. Good Design builds community. If you had driven past the front of the Pacific Blue Inn yesterday at about 3 pm you would have seen a conclave of 2 power wheelchairs, 3 manual wheelchairs, one person on crutches, and a fluid group of up to six others on foot all discussing the design and implications of the Inn. In this case even conversation about Good Design in front of a vivid example of it was an experience of community. Michael is an investor who lives in one of the two condos at the Inn. Rumor has it that he is a brilliant breakfast chef. I am seriously considering testing that rumor at breakfast on July 19 after the 2009 Day on the Beach the day before! Liz and Sebastian are also investors. In a surprise example of "it's a small world" it turns out that Sebastian had contacted me recently for advice about travel in South Africa. Today Mandy Rapson, who is developing inclusive tourism itineraries at www.africanencounter, wrote to say she hopes to visit. Getting her lodged at Pacific Blue Inn provides another excuse to check out Michael's culinary talentswill get Liz and Sebastian the firsthand travel advice they need! The gathering included site developers Deborah and Joseph Quigg who pointed out that another of their fully-accessible building projects is set to go up across the street. Joe, whho happened to be there from the Disabled Students Office at Cabrillo College, expanded the commnity perspective. Present only through a quick phone call was one of Santa Cruz' prominent Universal Design promoters, Michele David and I discovered that Bonnie Leukowicz of Access Northern California had just spent the night at Pacfic Blue Inn to write an article on it for Russ Willicut at Venture magazine. So, instead of the in-depth coverage of the Inn that Bonnie will provide in an upcoming issue of Venture I leave you with a few photos and an invitation to stay at the Pacific Blue Inn when you come for the 2009 Shared Adventure's Day on the Beach. Who know who you will meet there! 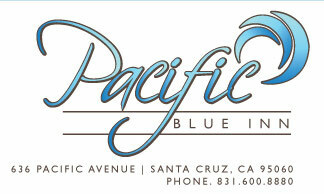 See the new Pacific Blue Inn firsthand. Want Green? Want Universal Design? Well, it seems that Good Design has converged at Pacific Blue Inn in Santa Cruz California. This afternoon will be a short trip "over the hill" from San Jose to the beach at Santa Cruz and some photos of this new reason why the town is an appealing destination of choice for people with disabilities. 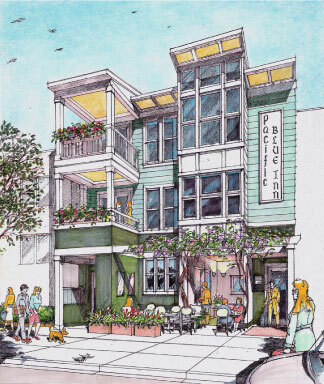 Inspired by the NY Times article "36 Hours Santa Cruz" the founders of the Inn set out to create an environment that would allow visitors to take advantage of the best of Santa Cruz all within walking distance of their accommodations. Nestled halfway between Santa Cruz's world famous Beach Boardwalk and the bustling Downtown area, Pacific Blue Inn offers you a quiet secluded courtyard room to get the perfect nights sleep with a breakfast you won't forget, right within walking distance to restaurants, cinemas, performance theatre, music venues, bookshops, galleries, the beach, surfing as well the world famous Beach Boardwalk amusement park and wharf. What a huge difference six inches can make! 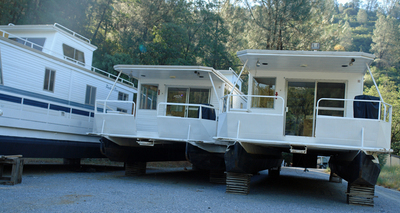 During the growth period of houseboating on Lake Shasta in the 1960's, 70's, and 80's over 300 boats were constructed. Unfortunately, none were designed to accommodate wheelchairs. Charter craft accessibility is limited on the lake known as "the houseboating capitol of the West." 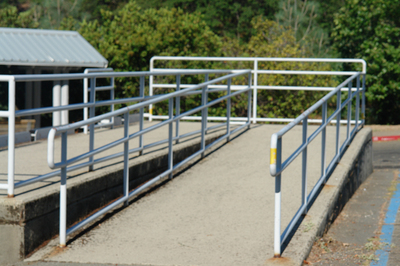 Yet, at the launch managed by the National Park Service you can use this versatile ramp for getting from your wheelchair to your boat (on a trailer) at no charge. Eugene Oregon was a much anticipated respite while driving back to the San Francisco Bay Area alone from a trip to Bellingham and Seattle Washington. The staff at Mobility International USA (MIUSA) welcomed me warmly as I dropped in on short notice. If you are in the region consider supporting their upcoming fundraiser (below). for those involved in international exchange and disability mark your calendar for their October 30 event. Meeting Patty Prather and getting tour of the City of Eugene's universally designed Hilyer Community Center certanly made the region seem appealing and livable. 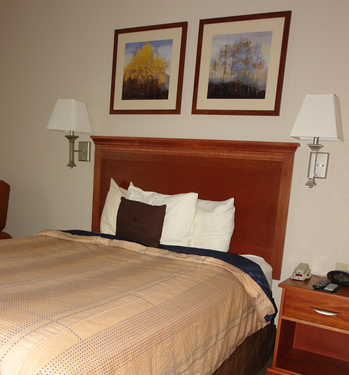 Off highway I-5 across from the Medford Airport is the Candlewood Suites hotel. 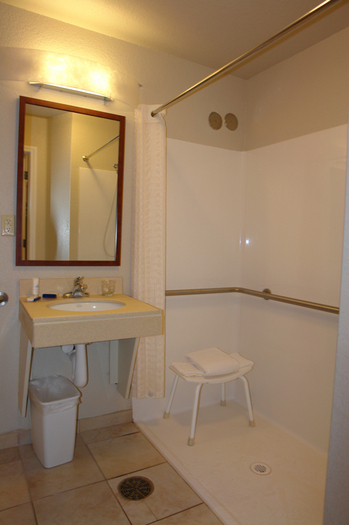 Here are some photos from one of the accessible rooms - Room 114. WaypointYCS commented on Day 4 - Meandering to Petermarizburg on the Arts & Crafts Route: Shopping?